Are You Measuring Egress Widths Correctly? 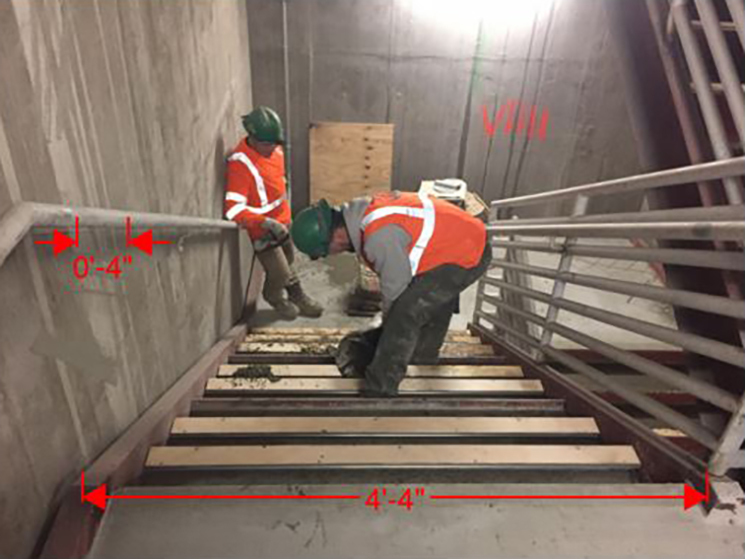 How to measure the widths of egress components like doors and stairs is one of those questions that code consultants get on a weekly basis. In many cases, there seems to be confusion on the minimum sizes of certain components and how to properly measure their widths properly. Stair egress measurements are commonly misunderstood. Should stairs be measured between handrails since this is where occupants can walk? Or are they based on the entire width of the treads? And what about stringers? Are those included in the measurement as well? This article is intended to address common questions associated with egress width. How wide are my means of egress components required to be? “Calculated width” which is based on the occupant load served by the component using the egress width factors discussed below. The larger width determined by the two methods above must be utilized to establish the minimum width for each egress component. In many cases, the minimum egress widths serving buildings with less concentrated occupant loads will be dictated by component widths, not calculated widths. The table at left illustrates several examples of this methodology for an unsprinklered building. What factor do I use to determine my “calculated width”? IBC Section 1005.3.1 requires that “the capacity, in inches, of means of egress stairways shall be calculated by multiplying the occupant load served by such stairway by a means of egress capacity factor of 0.3 inch per occupant”. Section 1005.3.2 addresses other egress components (such as doors, corridors, aisles, etc.) where the language is similar but utilizes an egress capacity factor of 0.2 inch per occupant since the speed of exiting on horizontal components is quicker than descending stairs. There are exceptions for stairway and other egress components to utilize 0.2 and 0.15 inch per occupant, respectively, where the building is sprinklered and equipped with an emergency voice/alarm system for all occupancies other than Group H (High Hazard) and I-2 (Health Care). Note that earlier editions of the IBC, as well as NFPA 101, differ in terms of the ability to utilize the reduced egress width factors of 0.2/0.15 inch per occupant as well as what protective features are required to do so (i.e. sprinklers only vs. sprinkler and an emergency/voice alarm system) so it is important to review applicable local and state codes to determine which factors are appropriate. How do I measure my egress widths? Egress measurements are based upon the clear, unobstructed widths available to occupants along the egress path in accordance with IBC Section 1003.6. 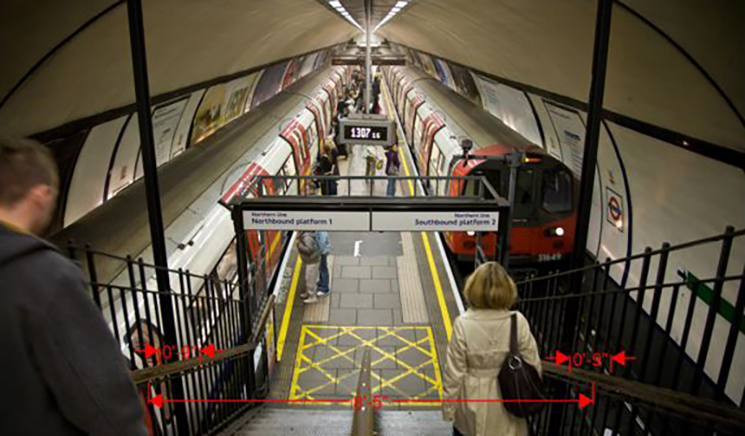 Projections would not be permitted within these widths unless specifically allowed by the code, such as panic hardware for doors and handrails for stairs. How do I measure the “egress” width of a door? For doors, the egress width measurement is based on the clear width of the opening which is not the same as the “nominal” door width. This is typically measured from the face of the door with the door open 90 degrees to the door stop on the strike side of the frame. For pairs of doors, this would be measured between the face of the doors with both open 90 degrees assuming there are no center mullions or other obstructions between. Since this is a clear width measurement, it is important that door hardware be considered. The configuration of hinges, pivots, etc. can all affect the exact opening measurement. Note that panic or fire exit hardware is an allowable projection up to 4 inches into the clear width where located between 34-80 inches above the finished floor and therefore would not be considered in this measurement (IBC 1010.1.1.1). When evaluating an existing building, this measurement can simply be made on-site, but conservative assumptions are typically made for those buildings still under design. As a general rule of thumb, a 3” reduction for clear width generally accounts for the 1.75” door thickness as well as any reductions due to door hardware. For example, a 36” door leaf is typically assumed to provide 33” of clear width. This door provides an egress capacity of 220 occupants (33”/0.15” per occupant) and 165 occupants (33”/0.20” per occupant), respectively, for sprinklered buildings with an emergency voice/alarm system and those buildings without such system(s). How do I measure the “egress” width of a stair? IBC Section 1014.8 permits handrails to project up to 4½ inches into the required width of aisles, stairways, and ramps on each side. Therefore, the egress width of a stair is measured as the clear width above the handrails (between obstructions such as a wall, guard, etc. ), unless handrails project more than 4 ½ inches into the stair, in which case the stair width is the measurement between the interior surface of the handrails plus 4 ½ inches on each side. This measurement typically results in stair egress width being measured from outside stringer to stringer as this aligns with adjacent walls and guards, but this can vary depending on wall or guard offsets from the stair. In many cases, there is a gap between the outside portion of the stringer and the adjacent wall or guards which can be counted towards egress width. Alternatively, the guard is sometimes located on top of the stringer, in which case the stringer width would not be counted towards your egress width. 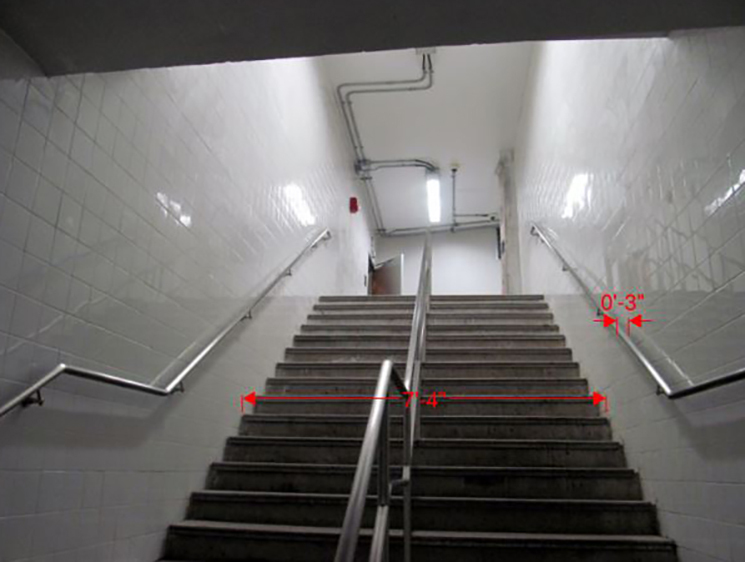 The figures below illustrate several examples of how to properly calculate stair egress width. Handrails project 3 inches on either side of stair. Egress width is measured above handrail height from wall-to-wall, resulting in an effective clear width of 7’-4”. In this stairway under construction, the handrails project 4 inches from the adjacent wall and guard on either side. The guard is also located on top of the inside stinger. Egress width is measured above handrail height from wall-to-guard, resulting in an effective clear width of 4’-4”. In this subway station, the stair width measured between handrails is 8’-5”. The handrails also project 9” on either side beyond the adjacent guards. Since handrails are only permissible to project up to 4½ inches on both sides, the effective egress width is 9’-2” (8’-5” + 4½” + 4½”). Note that egress from subway stations are typically calculated under different standards, however this is intended just for illustration under the IBC. This article cannot address all of the unique configurations one may find when evaluating egress widths of doors and stairs, but hopefully it sheds some light on this often misunderstood issue.